Indian food is so tasty, but like many other specialty cuisines, we are often intimidated of making these recipes in our own kitchens. I promise you there is nothing intimidating about this recipe. You’re going to love me in just twenty minutes, when this dish is in the oven and the smells start emanating. 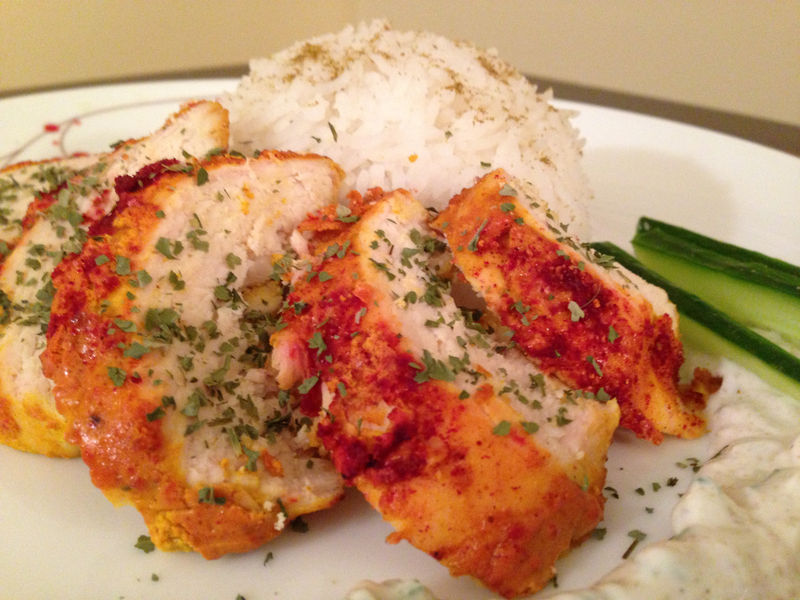 I adapted this recipe from Great Food Fast, adding additional spices to the chicken. The Raita is a homemade recipe based on all those visits to my favorite Indian restaurants. 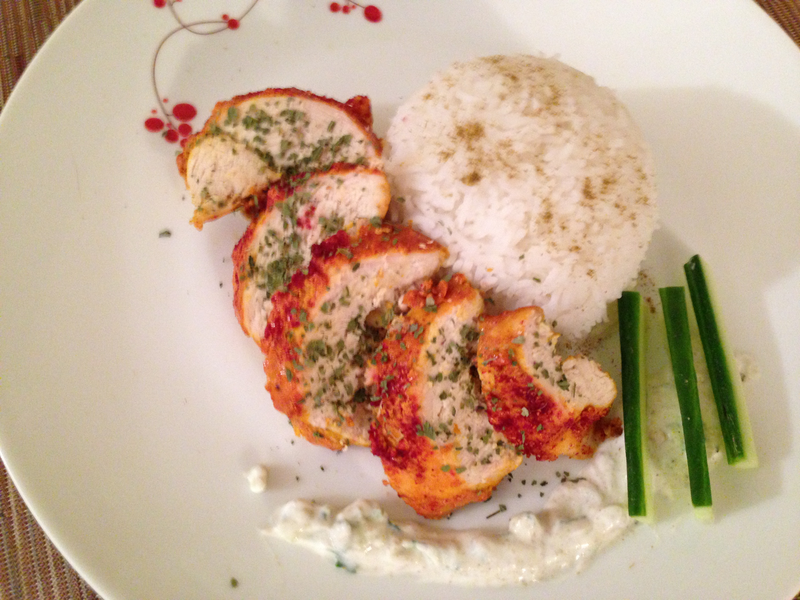 This recipe can be done on the spot, but if you have the foresight and the time, I would prepare the chicken the night before and let the breasts sit in your refrigerator, soaking in the Tandoori yogurt coating. It tenderizes the chicken and makes it that much more delicious. The Raita can also be made ahead and stored in the refrigerator. So let’s get spicy in the kitchen! Or not, if you don’t want to. I’ve not included any cayenne in this recipe, for all of those neutral taste-budded eaters out there. One of my favorite things about making spicy food at home is that you control the heat. I prefer to spice up a dish using cayenne pepper: I taste test a couple of minutes after every time I sprinkle in cayenne. I recommend using this progressive approach, because its very difficult to undo spice unless you add more ingredients. So for those of you who are looking to heat up this dish, sprinkle some cayenne and tell me how hot you like it! Always start with the ingredients that have to be cooked, that way you can prepare the uncooked ingredients while the others are in the oven, on the stove, or elsewhere. In this case, that means we start with the Tandoori Chicken. Preheat oven to 475 degrees. I told you the kitchen was about to get hot. In a large bowl, combine all of the ingredients except the chicken. Then, using your hands, coat the chicken breasts with the mixture. Regardless of whether they’ve sat overnight, or just been prepared, place each breast on a greased baking pan. I used a casserole dish. Bake for 20 minutes or so. Finish on broil for an additional 5 minutes. While the chicken is baking, chop and mince the chives and cucumber. If you have a food processor and are willing to take it out for this small task, I would recommend pulsing these ingredients a few times rather than chopping/mincing. If you don’t have access to one, don’t worry. The dicing and mincing will suffice. Chop the chives into half-inch-long pieces. In a small bowl, combine all of the ingredients. Chill in microwave until chicken is done. Take chicken out of the oven and sprinkle cilantro on top. It’s pretty and it tastes good.